N.Korea Replaces Chief Negotiator in Talks with U.S.
North Korea has apparently replaced its chief negotiator in denuclearization talks with the U.S., with Vice Foreign Minister Choe Son-hui handing over to the former ambassador to Spain, Kim Hyok-chol. 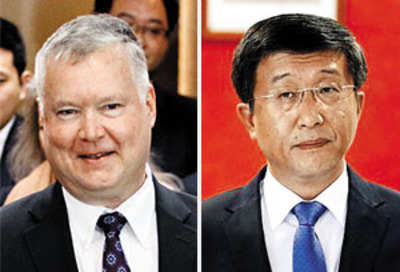 A diplomatic source in Washington said on Thursday, "It seems that the counterpart of U.S. Special Representative for North Korea Stephen Biegun has changed to Kim Hyok-chol. Choe Son-hui would still engage in the negotiations, but behind Kim." U.S. Secretary of State Mike Pompeo said in a speech via video conferencing at the World Economic Forum in Davos, Switzerland on Tuesday that Biegun had a chance to meet with his "newly designated counterpart." Kim Hyok-chol visited the U.S. last week with North Korean leader Kim Jong-un's right-hand man, Kim Yong-chol, and met U.S. President Donald Trump, Pompeo and Biegun at the White House. A photo of the meeting shows Kim Hyok-chol sitting on a chair at the end of the row and watching Trump. There was speculation that Pak Chol, the vice chairman of the North's Asia-Pacific Peace Committee, would take over, but he seems to rank lower than Kim Hyok-chol. 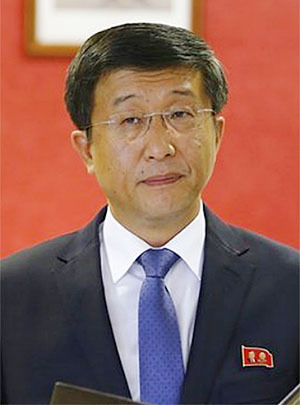 Kim Hyok-chol was born in 1953 and graduated from Pyongyang University of Foreign Studies before joining the Foreign Ministry in 1993. He currently holds the rank of vice minister. He was responsible for preparing Foreign Ministry reports sent to Kim Jong-un through First Vice Foreign Minister Kim Kye-gwan and is trusted by Kim Jong-un, according to a source. He has worked in the North America and Japan sections of the Foreign Ministry and served as ambassador to Ethiopia, Sudan and Spain. He was expelled from Spain in 2017 after the North's repeated nuclear and missile provocations. He also has experience in arms reduction negotiations from his time working at the North Korean mission in Geneva, Switzerland.